Rare and unusual are two words used to describe Senecio articulatus. With a few common names including the ‘Hot Dog’ plant it is most commonly grown as an indoor potted specimen. It is unusual, hard to find and a bit of a collectors plant, this is another of the rare South African species. With bluish green stems and silvery green foliage the plant is actually dormant for a large part of the year. It bursts into life in the winter when water is available, small white to pink flowers in winter are an added attraction to the interesting foliage. Also known as the Candle plant it is rarely offered for sale in Australia, one that is popular amongst collectors. Senecio articulatus is best grown as a container plant, a free draining soil and part shade for this lovely little plant. Propagation is from stem cuttings taken while in early parts of the growth cycle. Best grown in full sun with a little afternoon shade. A very well drained soil is essential and Senecio articulatus is often grown in containers. In a reasonable soil, little to no fertiliser will be required, in fact to much fertiliser can damage the plant by forcing it into tall leggy growth which can collapse. Limit regular watering to when the plant is in active growth. At other times once every four weeks, and then only if the soil has dried out. 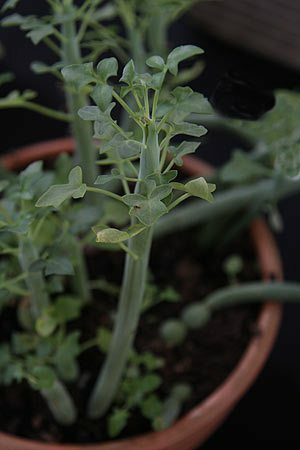 Common Names – Candle Plant, Hot Dog Plant. Senecio articulatus var. globosa is similar, however with more swollen joints or nodes.